A fun group of blogs have gotten together to celebrate May Day with a giveaway hop! Please make sure to visit each blog on the Linky to enter to Win! Grandma’s Pure and Natural, made by Remwood Products Company, is based in Tulsa Oklahoma and they pride themselves in their products. Grandma started researching the oils that soap is made from to find oils that are more compatible with human skin than oils found in commercially produced detergent soaps and gels that are available in stores. When she announced to grandpa she was going to start making soap to add to the product line he said SOAP! Grandpa said, “do you know how to make soap?” Grandma said “no, but I didn’t know how to cook either when we first got married 46 years ago. I can come up with the best soap you have ever used,” and she did! All of her soaps are unlike any other soap on the market and are pure natural soaps with no chemical or detergent additives. Another added benefit of Grandma’s Soap is directly related to your skin. Their website is full of customer testimonials who FIRMLY believe that Grandma’s lye Soap eases eczema, psoriasis, insect bites, and a host of allergy and medication related skin problems. If you think about it most soaps on the market contain chemicals like isoprophyl alcohol, diethanolomine or DEA, and butylated hydroxytoluene. Grandma’s Lye Soap removes bacteria and irritants, and at the same time the natural oils alleviate itching and inflammation. I really love the way it makes my skin feel. So……. 1 lye soap bar, 1 grime away bar, 1 acne bar, 1 Don’t Bug Me Bar, 1 Poison Ivy Bar and a 2oz bottle of Hand Soother lotion. 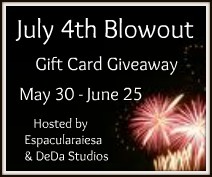 So enter the rafflecopter HERE and then hop along to the other great blog giveaways below!